Schedule Your Summer Nashville Pressure Washing Appointment Today! 27 Jul Schedule Your Summer Nashville Pressure Washing Appointment Today! You can refresh the look of your property. 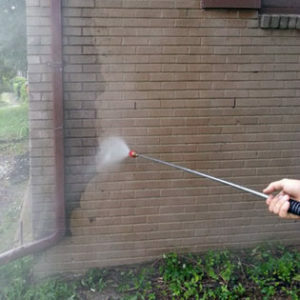 When you take advantage of commercial pressure washing services, you have the ability to not only clean the exterior walls of your property, but have parking lot cleaning, soft wash roof cleaning and concrete sidewalk maintenance completed as well. All of these areas are ones that really can benefit from commercial pressure wash services and can be completed during off-hours when the lowest amount of customers are present. Easily start a regular maintenance schedule. Starting with a complete pressure wash cleaning in the Spring or Summer will allow you to get on a regular maintenance schedule for all your properties. You can choose each time from a list of services you would like to have completed and can better anticipate your overall maintenance budget for the year. Attract new customers and clients. With the arrival of Spring and Summer, you will also see an increase in customer foot traffic to your property. Better driving conditions and much warmer temperatures acts as an encouragement for people to enjoy an evening out at a restaurant or to visit an office space. When your commercial site is clean and sparkling, more customers will want to visit your property, as well as stay longer. A great way to attract new tenants. Businesses looking for new locations want ones that are well maintained and will attract new customers to their businesses. A Nashville commercial pressure washing service will give your roof, siding and parking lot the best chance of impressing new tenants and increasing your revenue with quick sign-ups for commercial space leases. 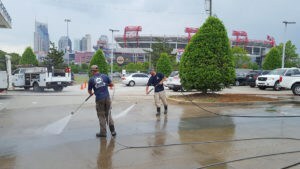 Call Pro Wash Nashville today for more information on commercial power washing!